Congress and President Trump have now killed 13 costly regulations under the Congressional Review Act. While some have celebrated the resulting regulatory relief, others have cried foul. In the absence of a legal argument against the CRA, they say that it’s unfair to use an “obscure” law. The latest peddler of this idea is Politico. 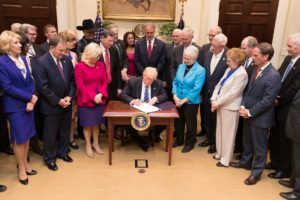 A recent article called the Congressional Review Act “an obscure rule-killing mechanism” that President Trump and Republicans in Congress are using to dismantle “popular” regulations. This claim is simply absurd on many levels, including that the CRA is by no means an obscure law. When the Congressional Review Act was making its way through the Senate in 1996, it had unanimous support. Senators John F. Kerry, Bob Dole, Dan Coats, Chuck Grassley and Harry Reid – hardly obscure politicians – were co-sponsors. In fact, the legislation was referred to as “The Nickles-Reid Congressional Review Act.” When Reid made his farewell address to the Senate in December, he proudly claimed the CRA as part of his legacy. Aside from the law’s prominent backers, agencies were also well aware of the law and its requirements. The Government Accountability Office sent multiple letters to the Office of Information and Regulatory Affairs notifying it that rules had not been sent to Congress. GOA encouraged agencies to fall into compliance with the CRA’s reporting requirements (although a later report from the special counsel at Administrative Conference of the U.S. indicates that they didn’t). Finally, Politico itself is no stranger to reporting on the Congressional Review Act. The publication covered it in an extensive story in 2008, when Democrats on the Senate Environment and Public Works and House Global Warming committees were considering rules to kill from the Bush Administration. Politico’s mischaracterization of the law didn’t go unnoticed on Twitter. @politico What’s so obscure about it? Signed in 1996 by Clinton. A lot less obscure than regulations issued by acting assistant deputy secretaries. @politico What makes one law obscure and another not obscure? Or do you only save the word “obscure” for attacking Republicans? In fact, a search of Politico’s website shows that from 2008 to 2014 more than 70 stories were published that reference the Congressional Review Act, and an additional 240 articles mentioning it were published after 2014. If the CRA is truly obscure, Politico may want to consult its subscriptions department to see why so many of its readers are blissfully unaware of the well-publicized law. This was originally published at Red Tape Rollback, a project of Pacific Legal Foundation.